Over 40% of adults snore. Nasal congestion (or a blocked nose) can make you breathe through your mouth instead of your nose which may cause snoring and a bad night's sleep for you and your partner. 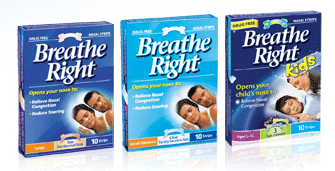 Breathe Right Nasal Strips gently open your nasal passages helping you to breathe better. Each drug-free nasal strip consists of flexible "spring-like" bands that when placed correctly across the nose, gently opens the nasal passages to make breathing easier.